One of a kind! By my reckoning, it was over fifty years ago when I first heard Jack at the Ashgrove. Amazing! This entry was posted in Photographs and tagged Elko, National Cowboy Poetry Gathering, NCPG, photography. Bookmark the permalink. Great photo, Duff. 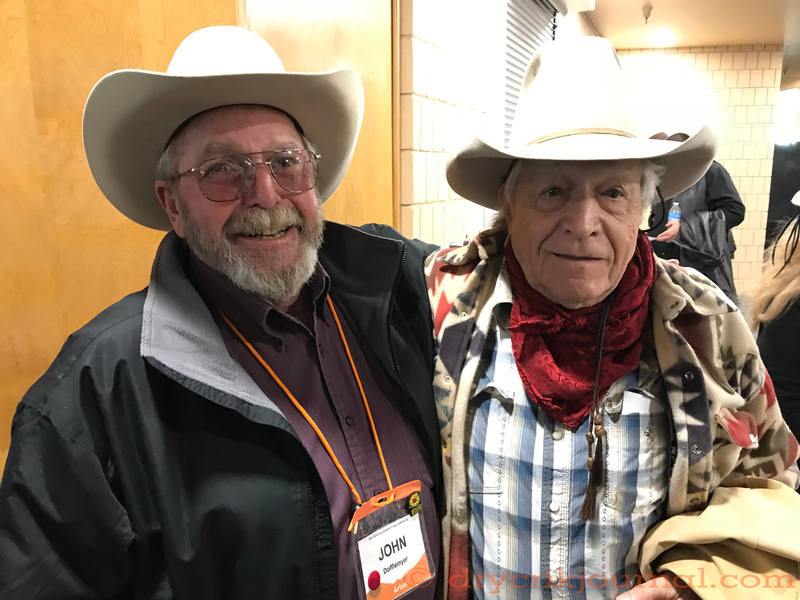 Ramblin Jack; a true treasure! I think I wore out the grooves on my copy of ‘Young Brigham’. Can still recite most of ‘912 Greens’. Saw Jack many times over the years. Once took a date to see him at the Great American Music Hall back in the early ‘70s. She purported to be a fan of his music…but clearly didn’t get Jack. He started in on a ramble and after a few minutes she hollered: “Get on with it!” (or something to that effect). Small, reverently quiet theater; very loud voice…and one large dude trying desperately to be invisible. It was about that same 50+ years ago that first heard him and his flatpick. 50 years later, my wife visited friends in Point Reyes and met him at a farmers market., Seemed like everyone in town knew him. Fall of 1966 into 1967 at the Ashgrove with Parker Kennedy and Joe Botkin is my recollection. Stopped the show when they tried to seat someone in the middle of his song. $4 cover, 2 drink minimum is what I remember. Of course my memory is often suspect. I too heard Jack fifty years ago at La Cave back East. He’s a White Horse show waiting to happen. the younger folk who might not know the living legend.